Huge Savings Item! Free Shipping Included! 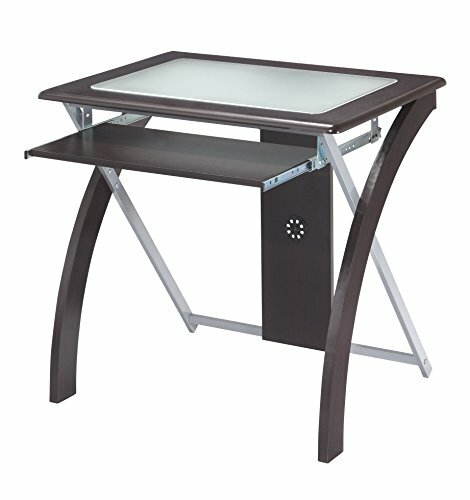 Save 13% on the OSP Designs Office Star X-Text Computer Desk with Pullout Keyboard Tray and Frosted Glass Top, Espresso and Silver Accents by OSP Designs at Momiji Studios. SKU: OF-XT59ES. MPN: XT59ES. Hurry! Limited time offer. Offer valid only while supplies last. Beautiful eye catching design espresso finish laminate with silver accent sample work surface large slide-out key board shelf 30''h x 31. 5''w x 23. Beautiful eye catching design espresso finish laminate with silver accent sample work surface large slide-out key board shelf 30"h x 31. 5"w x 23. 25"d desk top easy to assemble. Beautiful eye catching design.